The Microphone - PROTESTS, POLITICS, AND PEOPLE - Speak your mind. Tell your story. Don’t just buy them a sandwich. They’re not four. They have the right to spend their money as they choose – and it is their money, once given. Don’t just give to people performing, singing, or accompanied by a cute dog. Buskers deserve a wage too, of course. But homeless people are not your dancing monkey and they shouldn’t have to perform to earn your pity. Don’t second-guess whether people are “really” homeless. Those who think begging is a shortcut to easy money should try humiliating themselves daily in front of thousands of total strangers who won’t even look at them or acknowledge their existence. It is gruelling, soul-destroying work. If people are desperate enough to beg, they need it. Don’t just give to people who ask you directly, but to the guy with his head in his hands and a Styrofoam cup on the ground in front of him. Give to the woman who’s blind drunk. Give to the guy with meth-rotted teeth. Give to the spice addict who can’t look you in the eye. Many street beggars are addicts, yes. Do addicts not deserve food? Wouldn’t you want to drink if you were in their position? Don’t you get drunk every weekend to cope with work stress anyway? Who are you to tell them what to do with their bodies? Of course, it is true that your drinking habit and theirs are fundamentally different. Addiction is rooted in material circumstance – alcohol is the obvious example, but think how many skiing accidents end in courses of opiates far stronger than anything you’d find on the street without any long-term compulsion developing. It can only be tackled by raising people out of poverty, and a brute-force severing of cash flow is not going to starve people into seeking help from authorities they know will not, or cannot, help them. Yet this abject morality, which says we must push people to rock bottom before we are able to help them, is seized on by austerity governments always greedy to do less. In fact, studies show begging emerges in the “middle-late stages” of homelessness, once people have already exhausted other options. The rock bottom has already been reached. Eighty per cent of homeless people in the UK experienced no support or advice the last time they were moved on by police or council workers. When the government claims that most people begging on the street are refusing better help, what they mean is the help on offer is not adequate. Homeless people need free, state-provided housing and fully-funded psychological care. What they get is £538m annual cuts to mental health services and austerity measures driving them into arrears with private landlords and on to the street. 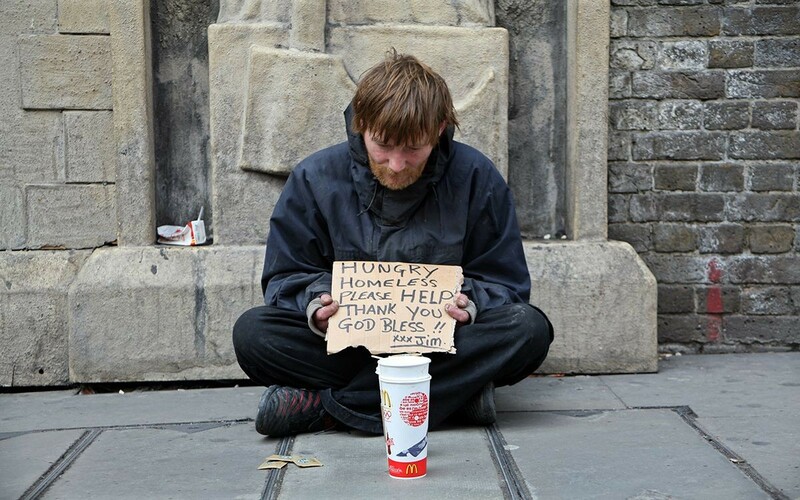 The average life expectancy of a homeless man in London is 47. For women, it is 43. This is lower than the general life expectancy of any nation on the planet. These lives will be improved by systemic, not loose, change. In the absence of an adequate government response, charitable giving and hostels remain lifesavers to many thousands of people. But big homelessness charities are already receiving millions yearly, while those deemed impossible to help die outside. When I speak to rough sleepers, it is local communities, squatters and grassroots organisations like the London-wide Streets Kitchen which they credit with keeping them alive. The charity, which is primarily funded by the government, makes no mention of the many gatekeeping barriers vulnerable people must cross to secure benefits and a stable hostel place. Most damningly, they do not mention the fact that the foreign nationals who make up over half of London’s rough-sleeping population cannot claim benefits to access the hostel network at all. Rather, Thames Reach and other top charities shop homeless foreigners to the Home Office to be deported. It is those same government-funded charities that push the narrative that “kindness kills” as they tout for your donations. Do not believe them. Apathy and austerity kill. Your kindness saves lives. Scott Morrison (The Schmuck) Will Ruin Lives By Scrapping Homelessness Funding. The Council to Homeless Persons says a new analysis of funding sources for homelessness services underlines the importance of the National Affordable Housing Agreement, which the treasurer, Scott Morrison, is expected to scrap in the upcoming budget. The report, released by the Australian Housing and Urban Research Institute on Friday, analysed survey data provided by 198 specialist homelessness services and found two-thirds did not receive enough funding to meet existing demand and 22% had experienced a “significant change” in their funding last year. Government funding accounted for 84.6% of funding to specialist homelessness services and 60.6% of the funding to non-specialist services, the report found. The bulk of that funding was delivered through the National Affordability Housing Agreement (NAHA) or National Partnership Agreement on Homelessness funding (NPAH). 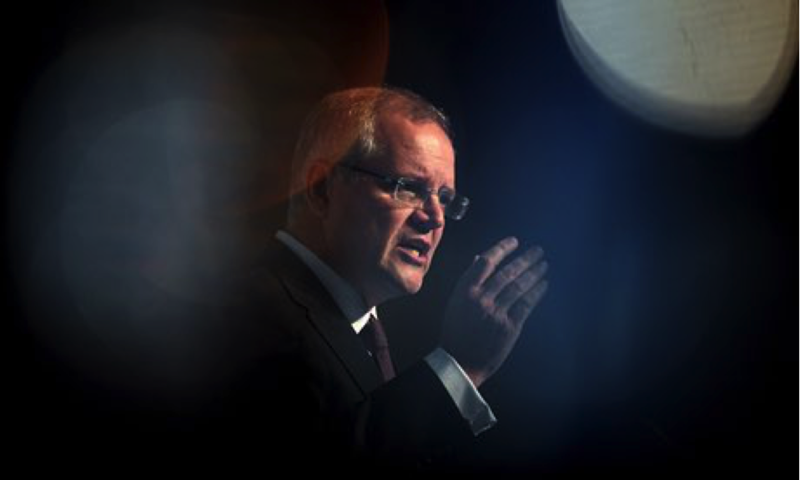 Morrison signalled in March that the agreement would be redrawn in next month’s budget, describing the $1.45bn a year agreement, which has been in place since 2009, as “a one-way ATM providing important resources without accountability for outcomes”. He said some of the money would be repurposed into other programs, such as a national bond aggregator to raise cheaper finance for affordable housing developments. The Council to Homeless Persons’ chief executive, Jenny Smith, said the report released on Friday showed funding provided under the NAHA was already “very busy money”. “That funding now is keeping 320,000 vulnerable families in affordable housing and funding two-thirds of our homelessness services,” she said. “We think it’s being very well used and does not need to be repurposed. Smith said specialist homelessness services turned away 70,000 people last year and that reducing or tinkering with their core funding “will only lead to more homelessness”. “In the end we can’t expect the market to take care of the most vulnerable and we need the federal government to invest in social housing,” she said. Prof Paul Flatau, of the University of Western Australia, was the lead author of the report. He said services were unable to fund other programs to reduce homelessness, like employment or drug and alcohol programs, because their funding went directly to crisis accommodation. Flatau said a number of services did not respond to the survey because they had lost their funding during the two-year survey period. Flatau said there should be a greater push toward alternative methods of funding, like philanthropic donations and social impact bonds, but that the sector would always need a high level of federal funding. He said the lack of investment low-income social housing or public housing combined with the success of priority access housing lists for people in urgent need of accommodation meant that the public housing stock was “virtually quarantined” for referrals from crisis accommodation services. That left people on very low incomes with fewer options, he said, and increased the chance that they would end up at a homelessness or crisis accommodation service themselves. The report also found there were no specific government funding programs targeting Indigenous homelessness, despite Aboriginal and Torres Strait Islander people being 14 times more likely to experience homelessness.